Back to school time is exciting but it can also be met with some nervousness for both children and parents. My daughter is starting first grade this year and that means she will be bringing a lunch to school for the first time and attending school all day. 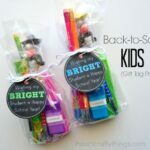 It’s going to be quite a change for her [and me] so I want to be prepared to ease her nerves the first day of school by helping her have the best first day of school! 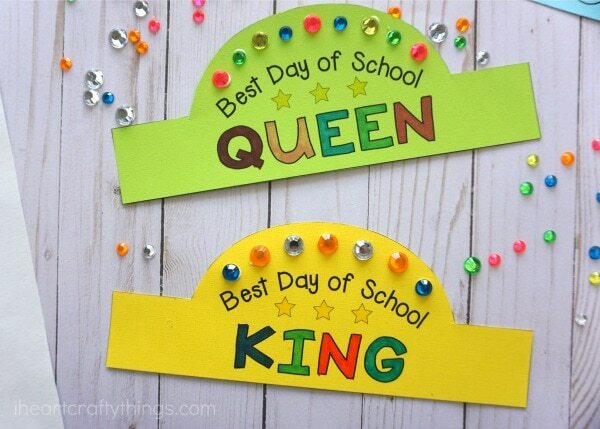 Surprisingly that’s an easy task thanks to Seattle’s Best Coffee Best Day List and our printable back-to-school crowns. What is this Best Day List? 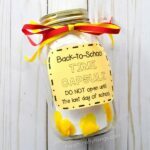 As Mom’s we want to make the first day of school the best for our little ones. 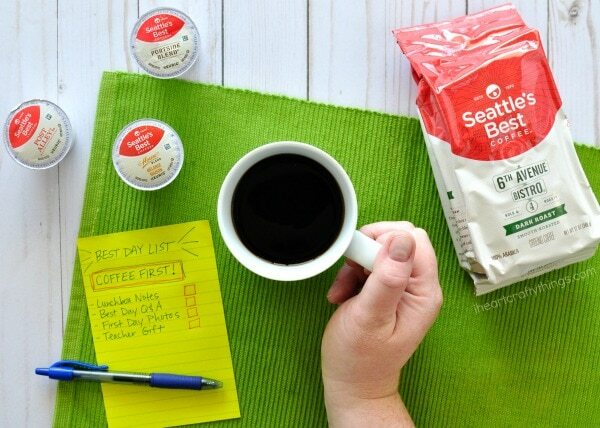 Seattle’s Best Coffee takes the guesswork away and lessens the stress by creating the Best Day List, a simple list with printables and ideas to help upgrade the first day of school. First on the list…coffee for Mom, of course! I’ve found if I wake up about 30 minutes before my children, brew myself a cup of coffee and take some time to myself to go over my to-do list while enjoying my hot coffee, I am calm and prepared to tackle the morning. Find some amazing recipes included with the Best Day List that will give something extra to your morning coffee. I can’t wait to try those fabulous coffee cream ice cubes! 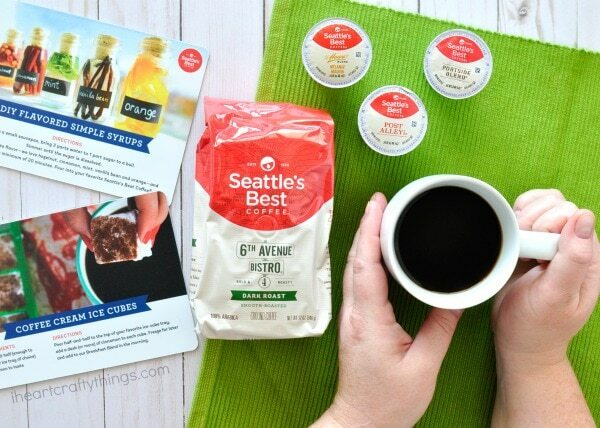 Make sure you grab your $1.00 off coupon for your next purchase of Seattle’s Best Coffee® too. Every kid needs to feel some extra love from home when they open their lunch box on the first day of school. 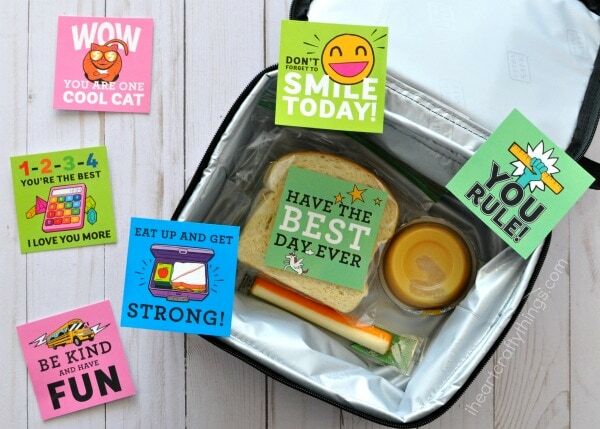 The Best Day List has you covered with their awesome printable lunch box notes. There are 10 in total so you can spread them out over the first few weeks of school to ensure your child feels extra special. One activity I look forward to every year is filling out a back-to-school Q&A with each of my kids. It’s so fun to pull out the one we filled out the year prior to see how much the kids have grown and changed. 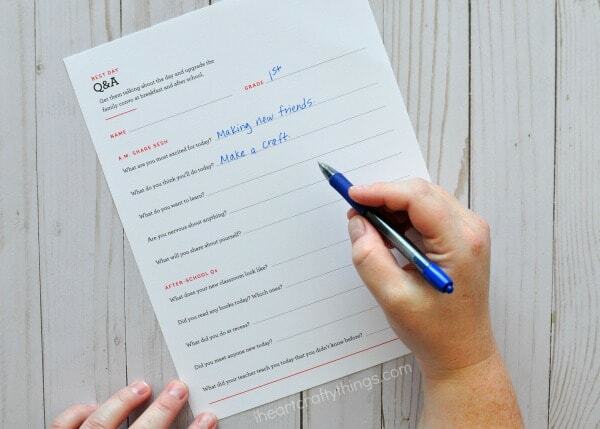 Find a great First Day Q&A printable to complete with your children as part of the Best Day List. I often feel like the first day of school pictures are the most stressful part of our morning. Sometimes kids aren’t in the mood for photos and it’s tough to force that perfect smile before the first day of school. 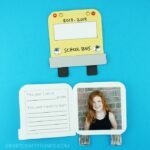 Throw out the stress and use these cute printable photo props for a fun photo session. Don’t forget to upgrade the teachers’ back-to-school! A fun mug full of Seattle’s Best Coffee makes a great first day of school gift. 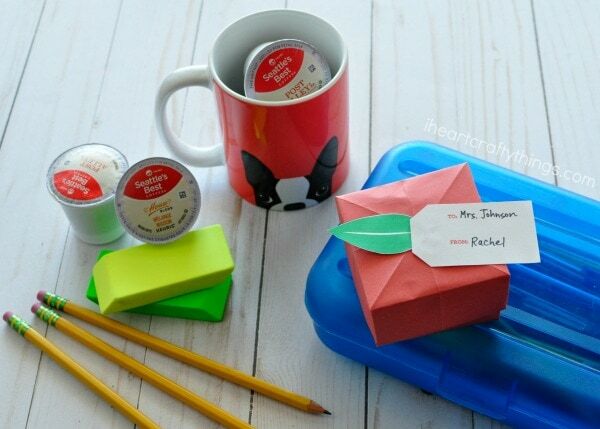 Or print out the darling apple box craft included with the Best Day List and fill it with goodies for a back-to-school teacher gift. 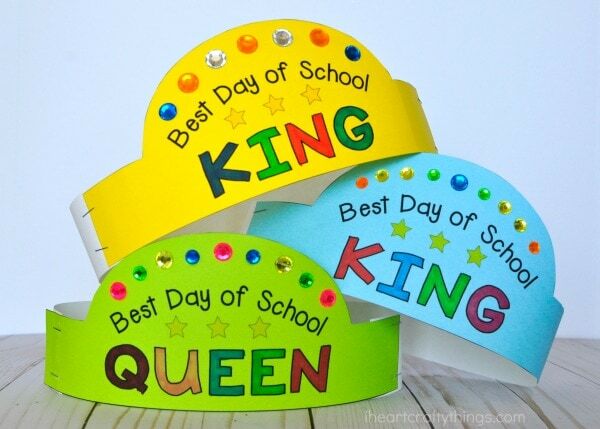 Another way I am helping to cure the back-to-school nerves is with our fun printable back-to-school crowns. Have your child wear one in the morning as they eat breakfast and while taking pictures to help them feel confident that they can tackle the first day of school with ease. 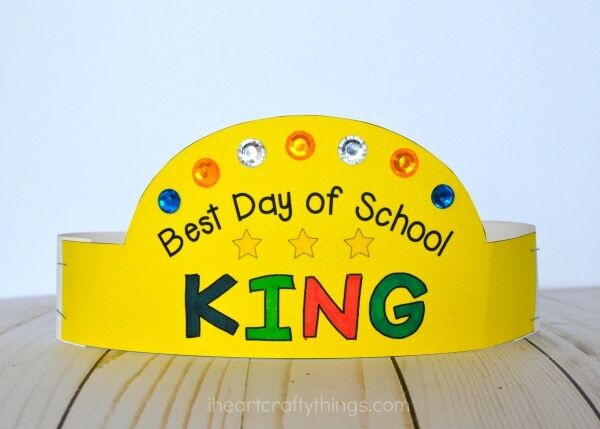 Back-to-school crown printable, printed on cardstock <—- Download the crown printable here. 1. Gather your supplies. 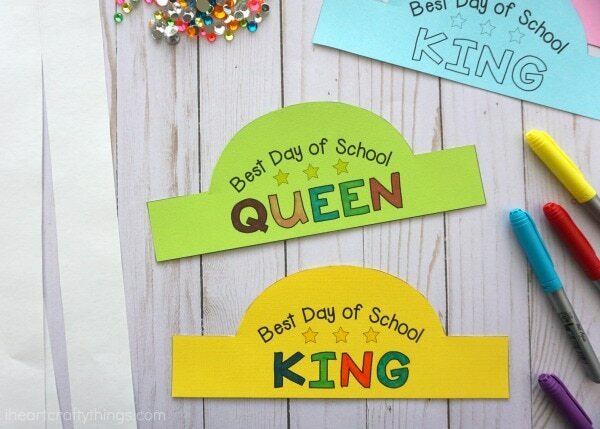 Print out the back-to-school crown printable on colored cardstock. Cut out the crown. You’ll also need to cut out a 2-inch strip from your white construction paper for the back of your crown. 2. 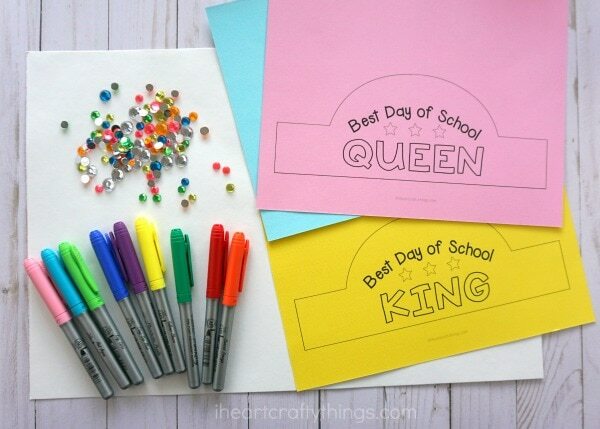 Use your markers or crayons to color in the letters of the crown. 3. Glue craft jewels at the top of your back-to-school crown with tacky glue. 4. When your glue has finished drying, staple one end of the white construction paper strip to one end of the crown. Place the crown around your child’s head to measure how much length you need of the white construction paper. Cut off any excess of the white construction paper and then staple it to the other end of the crown closing it shut. 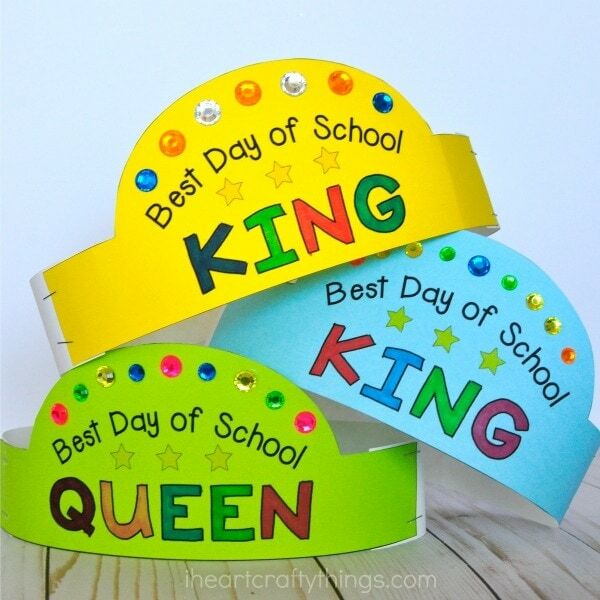 You back-to-school crowns are finished! 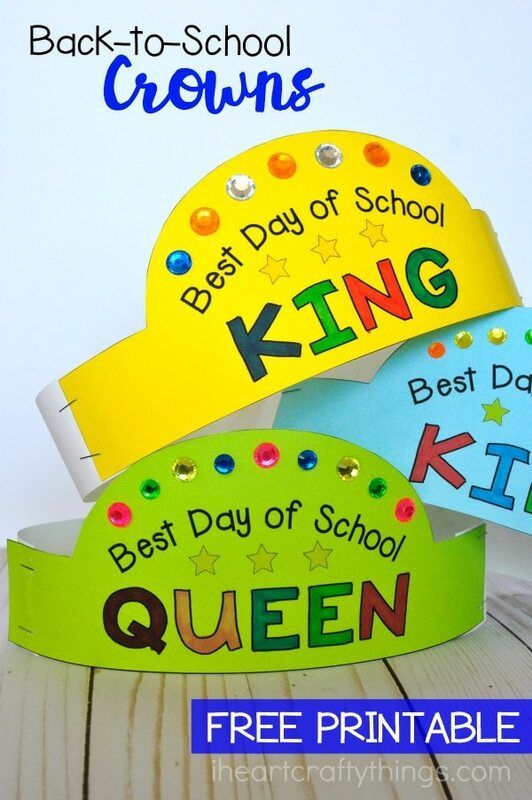 Kids will enjoy wearing their crowns before school but you can also continue the fun after school by having them wear them when they get home while they tell you all about their awesome first day of school. Do you have any back-to-school tips or tricks that you would add to the Best Day List to help your kids have the best day of school? We’d love to hear them!